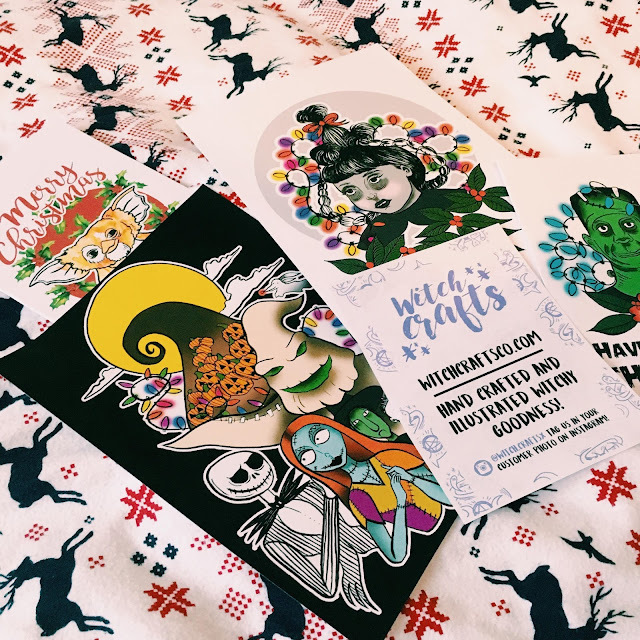 Hobbits & Hairdye: Alternative Christmas // Witchcrafts. Looking for some last minute gift/ card ideas for your 'alternative' (ew I hate that word, but you get what I mean) friends? Look no more. I'm no Christmas scrooge, but it's safe to say that for me Halloween is number one, and it's so ridiculously difficult to find Halloween/ Spooky things during this time of year. Witchcrafts Christmas collection offers everything you need to create the perfect goth Christmas. The prints and cards are mostly inspired by film and television, but with it's own twist. 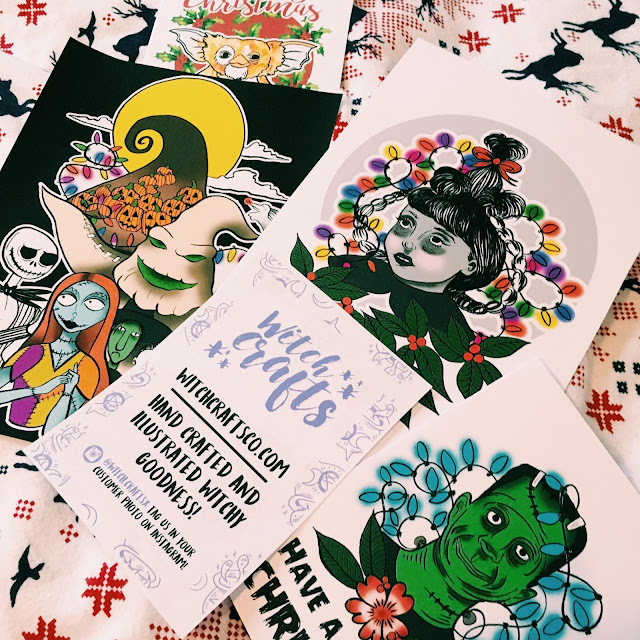 I have been obsessing of Witchcrafts' prints for ages now and own so many pieces already, so when Jess offered me the chance to collaborate with Witchcrafts' Christmas collaboration I very nearly fell of my chair. The thing I love most about this store is that all the artwork is so unique, despite being inspired by things. Jess is such a talented artist and does an outstanding job of creating the perfect witchy designs. I would 100% recommend checking out WITCHCRAFTS if you are looking for something a bit different this Christmas, you will not be disappointed. I think today is the last day for guaranteed Christmas delivery so most definitely get on it, if not these pieces are perfect all year round. 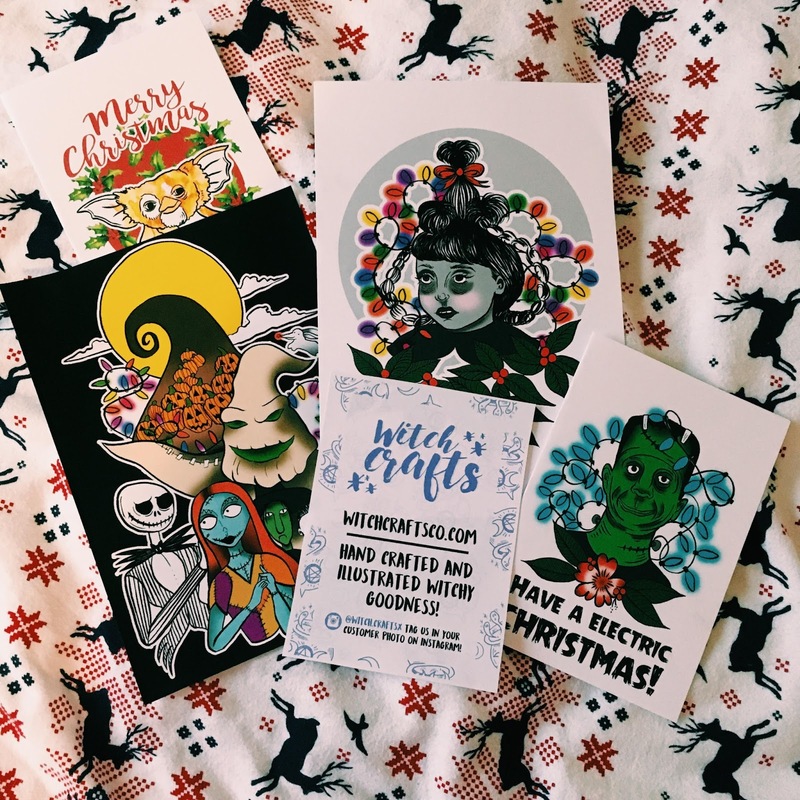 I am so obsessed with all my prints and cards, especially The Nightmare before Christmas one, that will 100% be taking pride of place in my room all year round. This collection is up there with the Halloween collection as being my favourite pieces of art. I am so excited for my Gothmas (goth christmas, duh) now that I've got the perfect decor, and I'm even more excited to see what new goodies are available going into 2018. I think it's so important around this time of year to support small, independent businesses, especially those who are creating amazingly creative things. Jess herself is such a talented artist, an incredibly wonderful person and a brilliant blogger so be sure to check her out and give her some love, because this girl is going places and deserves all the support. What's your favourite Witchcrafts piece? What are your favourite independent businesses?